That’s how many websites occupy the internet today. With more websites and businesses appearing on the internet every day, the competition is fiercer than ever to stand out. Gone are the days where a simple out-of-the-box website theme, SEO hack, or one-size-fits-all marketing technique are enough to get found online and leave a lasting impression. In fact, not even the hottest web design trend will help you stand out in a crowd if your site isn’t designed around your goals or the audience you ultimately serve. If you’re looking to start the new year off strong by revamping your site, this post will challenge everything you think you know about what your website should be and how it should look. Ready to find out which trends made the list? Let’s go! With a new data breach happening every day, now more than ever people are wary of how their security is being handled online. If you’re running a website, you need to make sure it’s safe and secure so your visitors feel comfortable using it, especially if you accept credit cards, or have people logging into your site to access certain types of content, like an online course. Next, there’s the GDPR, which stands for “The General Data Protection Regulation.” It’s a privacy law from the European Union that went into effect in 2018. Even though it’s a European Union law, anyone who does business online is affected because anyone in the world can visit our websites at any time. With more and more people accessing the internet from their phones, having a mobile responsive website isn’t just a hot trend. It’s smart business. You need your site to be functional on different mobile devices, smartphones, and tablets so website visitors can access your website anywhere, without any problems, even when they’re in the bathroom. Website loading speed plays a huge role in 2019. Visitors expect your website to load as quickly, especially when they’re on their phones. If not, you can kiss their business goodbye. In short, your site should load in under 3 seconds. If it doesn’t, your search engine rankings could tank, but most importantly? It pisses off your website users. Not sure how fast your site is loading? You can test that on Pingdom and Google Mobile Speed Test. As website pages get longer and longer, scrolling upwards to the navigation menu is such a hassle. To solve that pesky issue, use fixed navigation on your website. This allows the menu to follow as the user scrolls. They can easily access other pages from any location without furiously scrolling to get back to the menu. Just make sure your menu isn’t too large. You don’t want it to take up half the screen, blocking visitors’ view to your website, especially when your site is viewed on a phone. With consumers becoming savvier online and beyond, they’re more likely to spot a stock photo from a mile away. Stock photos are a big turnoff to website visitors because they’re so impersonal and don’t represent you or your brand as an individual. After all, anyone can buy the same stock photo of two business dudes shaking hands, and before you know it, it’s as ubiquitous as women laughing alone with salad. Custom photography showcasing you, your business, and you actually working with your clients shows you take your business and your brand seriously. It lets your customers see themselves working with you, and feel what that experience will be like. Gone are the days where your site functioned as merely an online brochure, spouting about your mission statement, and listing your services for people to click on. Now, it’s important to use empathy to get inside our target audience’s head and make sure they know they’re in the right place on our websites. The best place to start when thinking about the copy on your website is to read Donal Miller’s book Building a Storybrand, which teaches readers the seven universal story points all humans respond to before they make a purchase of a product or service. It lays the groundwork to ensure that you’re connecting with your customers at a visceral level and conveying your competitive advantages accurately so you streamline your messaging. More than one billion hours of content is watched on YouTube daily. So, if you’re good in front of a camera, videos can be a great way to explain who you are, what you do, and why it matters to your potential customers. It also makes you look waaaaaay more professional than the competition. Just make sure your video is eye-catching and not too long. You want to keep people’s attention, not drive them away. Artificial intelligence is taking the internet by storm, and they can be great for businesses that can’t hire a full team of 24/7 customer service agents. This helps people get their questions answered sooner than waiting for an email or phone reply. Even better, you can take it one step further by installing a LiveChat function on your website that lets people ask questions to you, in real-time, about your product or service, which can be super handy if you’re launching a time-sensitive online course and the customer only has a certain amount of time to buy before the shopping cart closes. With so much competition out there, it’s more important than ever to stay relevant. One way to do that is to implement a couple of these, not just “trends”, but solid business practices that’ll take your website to the next level. They set the mood for 2019, combining technological advances with security and empathy. Using these web design trends will ensure you stay on the mind of visitors to come. Not sure if your website has beauty and brains? Purchase my website and digital strategy review today! 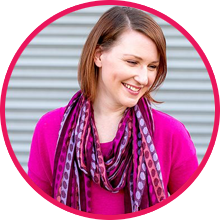 Natalie McGuire is a Web Designer + Digital Strategist for purpose-driven solopreneurs because she believes the world is a prettier place when people make money doing what they love.Want to make more money with your website? Get my FREE 3-Day DIY Websites That Sell Mini-Course!